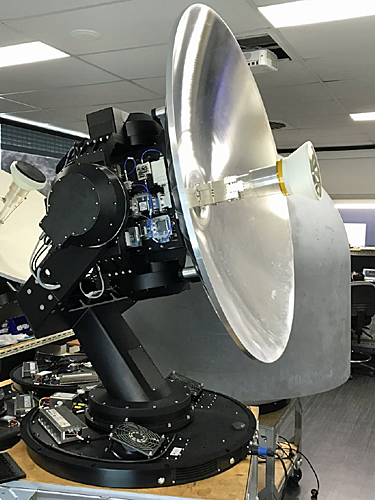 Less than six months after the first prototype terminal underwent initial sea trials, EM Solutions has delivered and installed their Cobra X/Ka tri-band Maritime Terminals on two recently launched Australian Navy Cape Class Vessels that are now in service. The Cobra X/Ka Triband Terminal prior to delivery from EM Solutions facility in Brisbane, Australia. Photo is courtesy of EM Solutions. The Cobra tri-band terminal supports four connected modems, enables simultaneous communication at X- and Ka-bands, provides services on military and commercial Ka-band satellites and is in the final stages of certification for the WGS and Inmarsat GX networks. This flexibility in service provision and the unique monopulse tracking technology used by EM Solutions, which maximizes the ability of the terminal to maintain satellite lock under the most extreme conditions, is a significant step forward in meeting customer expectations of assured broadband communications at sea. EM Solutions CEO, Dr. Rowan Gilmore, is a passionate supporter of Australian SME involvement in the provision of Defence capability and he stated that Cobra is world leading innovative technology that is fully designed, manufactured and supported in Australia. Initially seeded under a CTD program, the company commends the Navy on taking the next step in sponsoring WGS certification and commercially deploying this product on their Cape Class Vessels. He noted that EM Solutions is expanding their production capability for the firm's Satellite-On-The-Move (SOTM) terminals to support increased demand across the land and maritime sectors with a specific focus on interoperability and assuredness for government and military applications.